At least three of 10 people on death row in Indonesia for drug smuggling have been given formal notice of their imminent execution. Two Australians, Andrew Chan and Myuran Sukumaran, and a Philippines woman, Mary Jane Veloso were notified by Indonesian officials on Saturday. Under Indonesian law, convicts must be given 72 hours' notice of execution, but no formal date has yet been set. The appeals process for a French national is still under way. The group is being held on the prison island of Nusakambangan. "Indonesian authorities today [Saturday] advised Australian consular officials that the executions of Andrew Chan and Myuran Sukumaran will be scheduled imminently at Nusa Kambangan prison in central Java," Australian Foreign Minister Julie Bishop said in a statement. She said she would continue to press for clemency. However, Indonesia's government has rejected all appeals so far. 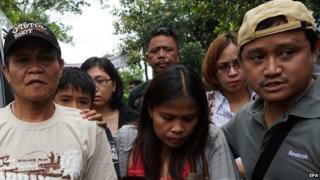 Veloso's parents, two sons and sister travelled to the island on Saturday to see her. Andrew Chan and Myuran Sukumaran were the leaders of the "Bali Nine" group arrested in 2005 while attempting to smuggle heroin to Australia. A court ruled that they had organised a nine-member smuggling operation and they were sentenced to death in 2006. Indonesian President Joko Widodo, who took office last year, has taken a tough stance on drug crime. In January he authorised the executions of six people, including five foreigners, convicted of drug offences. The group of 10 awaiting execution also includes Brazilian and Nigerian nationals.